Scarring and hyperpigmentation are an almost unavoidable reality when dealing with moderate to severe acne. Even if you’re careful to never pick your skin, cystic acne in particular often leaves a scar regardless of how diligent you are about not touching your face. 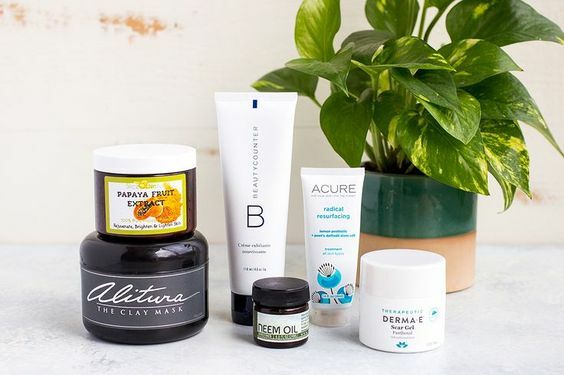 Although I would choose scarring over acne any day of the week, those lingering red marks that seem to stay on your skin for weeks and months on end are certainly no fun either. Especially after your skin has cleared, the last thing you want is yet another thing that makes you feel the need to cover your face in makeup. I’ve spoken about and recorded a video about my entire skincare routine for hormonal acne, but today I want to elaborate a bit more on my favorite natural solutions for acne scarring and hyperpigmentation. Keep in mind, this post is not about the type of scarring that leaves indentations on your skin. Although that kind of scarring is treatable, this post is specifically about discoloration, also known as hyperpigmentation. One last note, just like acne is impossible to heal overnight, the same can be said for scarring. I want to make it abundantly clear that none of these products or strategies are going to address a scar in a matter of days. The earlier you start treating a scar, the better. But for older scars, this can take multiple months. People approach me all the time saying they used these products for a week and didn’t notice a difference. This doesn’t surprise me. These things take time, but they do work. If you don’t believe me, all you have to do is look at the progress photos for when I had acne in this post. These are the exact products I used and within one full year I was able to not only heal my acne, but address 5 years of scarring. So without further ado, here are my favorite natural solutions for acne scarring and hyper pigmentation! As a general rule, I do not recommend using an exfoliating scrub when you are suffering from ongoing acne. Most exfoliating scrubs are far too gritty and can be extremely damaging to already damaged skin. I used to use a harsh exfoliating wash on my face when I was suffering from severe acne and stopping made one of the most noticeable differences in improving my skin. Having said that, the concept of exfoliating, helping your skin regenerate and produce healthier collagen, is exceptionally important to overall skin health and especially to alleviating scarring. The solution? Enzyme exfoliation. Instead of using a harsh scrub, you can accomplish the exact same result by using a much more nourishing and soothing mask. I love combining the Alitura Clay Mask with Papaya Fruit Extract for enzyme exfoliation. When my acne was at its worst, I used this mask every 3 days. Not only did it help to calm my inflamed skin, but it also made a noticeable difference in eliminating scarring and improving my overall complexion. Click here to learn more about some extra goodies I like to add to this mask to really help it to penetrate and heal damaged skin. Now that my acne is vastly improved, I still use this mask once a week to address some lingering scars and overall appearance of my skin. The Beautycounter Cream Nourishing Exfoliator is the one exception to my “no exfoliating scrubs when you have acne” rule. This is BY FAR the most gentle exfoliating wash I’ve ever used and now that my acne is mostly all healed, I feel comfortable using this every couple days. Just like the mask, this scrub is helpful for helping our skin regenerate, thereby decreasing the appearance of scarring and hyperpigmentation. Plus, since all Beautycounter products are 100% non-toxic, I feel safe about using this knowing that I am not smearing endocrine disrupters and other damaging chemicals on my skin. Want to learn about some other Beautycounter products I love, including their non-toxic makeup? Click here. Neem oil has a ton of beneficial properties for skin including being antiviral, anti-fungal, anti-bacterial and anti-infammatory, but what I love most about it is its ability to alleviate scarring. I’m going to be honest, this oil doesn’t not smell all that great. However, after a few applications, I mostly got used to it. I like to apply neem oil to scars at night and gently rub it into the problem area. Neem oil can be greasy, so you don’t need to overdo it. A little goes along way. Neem oil is also totally safe to apply as a spot treatment to acne or pesky pimples because it’s antibacterial. This way you are killing two birds with one stone – working to heal your pimple while simultaneously helping to prevent a scar from occurring in that same spot. I absolutely love the Radical Resurfacing Treatment from Acure. I know I prefaced this post by saying that none of these salutations are immediate, but I have to say, I notice quite a difference after using this product even once. It’s extremely thin, so it’s perfect for wearing under your regular moisturizer. I try to apply this normally twice a day, once in the morning and once at night. Although you can absolutely apply this product to your entire face to help with overall skin tone and evenness, I normally only apply this to my cheeks and forehead where I still have a bit of lingering scarring. This product was something I used to use on scars that weren’t on my face, but when a friend of mine told me she used it for her acne scars, I tried it and was hooked. This is definitely a product that works best when used right away on a new scar. However, it also works on older scars as long as you’re diligent about applying it. This product is a little thick and sticky, so it’s not something you would want to wear under makeup if you wear makeup regularly. When I am home and not applying makeup, I put a little bit of this scar gel on up to 5 times a day. I know that sounds crazy, but it recommends using it multiple times a day for the best results, so if I’m home and have it accessible, why not? When I am wearing makeup, I normally try and apply it at least once a day, normally at night before I go to bed. Want all my skincare posts sent directly to your inbox? Subscribe to my skincare newsletter here and join my private Skincare Facebook Group here where you can ask me questions directly and connect with like-minded women!